Save 20% on All-Bloom Fertilizer when you purchase it with this annual collection. 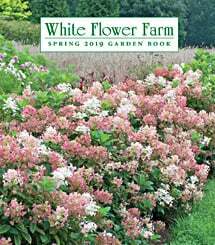 Just add this annual collection to your cart, add the All-Bloom Fertilizer (Item #51014) to your cart, and use promo code GROW20 at checkout to activate your discount. Ships as: 1 PINT 28.86 CU IN. The great value of many plants we grow as annuals is their ability to get up to speed quickly and carry on for months at their full potential. This is a composition of such strong growers, with beautiful leaves ranging from blackish maroon to green and yellow, with some rose and salmon blooms added for contrast. One of each variety, 5 plants total. Container not included. Some plants require more space in container gardens than others. To accommodate the 5 plants in this collection, we recommend a container at least 12″ in diameter and 12″ deep. This collection is shown in our All-Weather Fluted Planter, which is sold separately. Click here to order. Every state has agricultural regulations that restrict the shipment of certain plants. We're sorry, but we cannot ship this item to the following states: ARIZONA, ARKANSAS, ALABAMA. The size of the plants we ship has been selected to reduce the shock of transplanting. For some, this means a large, bareroot crown. Others cannot travel bareroot or transplant best if grown in containers. We ship these perennials and annuals in 1 pint pots, except as noted. We must point out that many perennials will not bloom the first year after planting, but will the following year, amply rewarding your patience. We ship bulbs as dormant, bare bulbs, sometimes with some wood shavings or moss. Shrubs, Roses, vines, and other woody plants may be shipped bareroot or in pots. The size of the pot is noted in the quick facts for each item. We ship our bulbs and plants at the right time for planting in your area, except as noted, with orders dispatched on a first-come, first-served basis by climate zone. Estimated dates for shipping are indicated in the Shipping Details box for each item. Please refer to the Shipping Details box to determine the earliest shipping time. Unless you specify otherwise, fertilizers, tools, and other non-plant items are shipped with your plants or bulbs. Please supply a street address for delivery. Kindly contact us with two weeks notice, if you'll be away at expected time of delivery. We guarantee to ship plants that are in prime condition for growing. If your order is damaged or fails to meet your expectations, we will cheerfully replace or refund it. Please contact our Customer Service Department at 1-800-503-9624 or email us at [email protected]. Please include your order number or customer number when contacting us. Very disappointed. Four of the six plants died within a few days of planting. I have planted WFF containers in the past with success (and enjoyment). But this time it was a disappointment. 2013 was the first year I tried this collection. IT was spectacular. I used it in a high planter near my garage/side door and everyone who came in commented on it. The pic is of it just getting started in June, but it was still going strong in early October! In fact it bloomed vigorously until killed by a hard frost. One note: I couldn't get the Butterfly Pink Impatiens, so I did make a substitution for it. I plan to grow it again this year in exactly the same spot. The only thing it required was a little fertilizer and some regular trimming back of the Ipomoea and Coleus. This collection sits in my memorial pet garden. Visitors are immediately drawn to it , thanks to August Moon. This is a beautiful collection of plants, great colors and great textures. I planted them in tall concrete urns flanking my garage doors, and they are very eye catching. However, I have not been able to get the Sunpatients Variegated Salmon to bloom; gorgeous foliage but no blooms. I think they need more sun than my heavily shaded spots provides. Choosing a pot and growing mix: In addition to our Annual Collections, most of the plants we offer can be grown, either singly or in combination, in containers. Any container with a drainage hole in the bottom will suit. The growing medium in containers must drain much more quickly than garden soil. Planting: Begin by adding potting mix to the container until the container is about 3/4 full. (If you use a dry, peat-moss-based mix, you must first moisten it by placing it in a plastic tub or a wheelbarrow and slowly adding water until the mix is moist but not soggy.) Next, set the plants on the mix one by one, spacing them much more closely than you would when planting them in the ground. Put the tallest plants in the center of the container. Surround them with the shorter, mounding plants, and put trailing plants along the edge. When you are pleased with your arrangement, add potting mix to bring the level to within an inch or so of the container's rim and firm lightly. Finally, water thoroughly. Container care: Plants in containers need special care. They dry out more quickly than plants in the ground; in the heat of summer, you may have to water them daily. Because of the need for frequent watering, nutrients soon wash out the bottom of the pot. To keep annuals growing and flowering, we suggest you water with a balanced, water-soluble fertilizer mixed as directed, every other week in summer. (Other plants—bulbs, perennials, and shrubs—need less fertilizer; a half-strength solution applied once a month through August is enough.) Our Vermont Compost Plus is a mix of 10 ingredients, organic and mineral, that will revitalize last year's potting soil and slowly release nutrients throughout the season. All-Bloom Fertilizer is a 15-30-15 product that can be diluted in water and applied regularly during the growing season. Finally, to look their best, all plants in containers need regular grooming. Remove spent flowers regularly and prune vigorous growers to keep them in check. Preparing for winter: In climates where winter temperatures drop well below freezing, containers should generally be dismantled in fall. Bring tender plants indoors or toss them on the compost heap; plant hardy bulbs, perennials, and shrubs in the ground. Most containers should be emptied of potting mix and stored under cover; only plastic and fiberglass pots can be left out over winter without cracking. In mild-winter climates—say, Zone 8 (10°F) and warmer—hardy plants can generally be left outdoors in containers with little risk either to the plants or to the pots. White Flower Farm is a family-owned mail-order nursery located in northwestern Connecticut. Since 1950 we have been providing a wide range of perennials, annuals, bulbs, shrubs, vines, amaryllis, gardening tools & supplies, and gifts for gardeners. We also offer gardening advice and how-to information to gardeners throughout the United States. We invite you to browse our website, and to join our email list for special offers and useful gardening tips. White Flower Farm&REG; is a registered trademark of White Flower Farm, Inc. This institution is an equal opportunity provider. All contents © 2019 White Flower Farm All rights reserved.